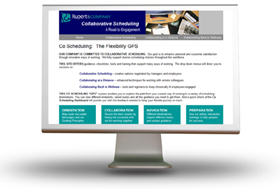 Over its decades of flexibility consulting and tool development, Rupert & Company has realized and promoted the importance of seeing all flexible schedules as negotiations over the best way to integrate time, talent and task. The FFWO prescribes all the elements needed for good flexibility outcomes. Eligible employees, written proposals, a meeting of employee and manager and approval or denial based on business reasons are typically present in successful flexibility initiatives. One missing success factor: willing employers, driven by a strong business case. Supervisor Chiu lays out in the 2-minute video the case for employee satisfaction, family support, greater productivity and enhanced retention that some employers will share. They will comply with the FFWO process and see benefits for companies, customers and employees. It is possible that as many or more employers will find themselves complying with the letter, but not the spirit of the new law. They will post, but show minimal enthusiasm for the FFWO. They will provide little guidance to employees and managers, push all deadlines to the limit, hold perfunctory meetings and find a reasons to say no in the numerous acceptable standards. They will comply with the requirements of the FFWO while violating its spirit. The Ask4Flex website introduces the missing success factor. Working within the FFWO framework it advocates for collaboration over compliance as the higher-level goal for employers. In sections addressed to the employer, the manager and the employee, the site fleshes out the process to make mutual gain the focus of every step. Rather than rely on enterprise goals (such as retention and productivity) or social goals (such as reduced family flight) each negotiation is grounded in practical gains for the person and the business. Clear claims from all employees are articulated in proposals, in meetings and in acceptance, modification or denial of proposals. By collaborating openly on a business basis, the gains sought by FFWO and achieved elsewhere by fully collaborative scheduling are possible.